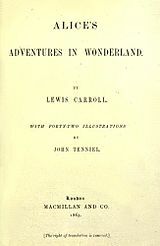 Alice's Adventures in Wonderland (commonly shortened tae Alice in Wonderland) is an 1865 novel written bi Inglis author Charles Lutwidge Dodgson unner the pseudonym Lewis Carroll. It tells o a girl named Alice who faws doun a rabbit hole intae a fantasy warld populatit bi peculiar, anthropomorphic creaturs. The tale plays wi logic, givin the story lastin popularity wi adults as well as wi childer. It is considered tae be ane o the best examples o the leeterary nonsense genre. Its narrative coorse an structur, characters an imagery hae been enormously influential in baith popular cultur an leeteratur, especially in the fantasy genre.